For most Americans, the New Year starts on January 1. That’s when people reflect on the year gone by and set goals and resolutions for the year to come. But that’s not the case at Auburn. For Auburn’s students, faculty, and staff, the new year begins in late August, when fall classes kick off and the warm air is charged with anticipation of another year on the Plains. This year that date was August 21, which coincided with a once-in-a-lifetime solar eclipse that brought the campus together. We wrote about that in last month’s reflection. Compounding the excitement of classes, old friends, and new experiences, is football. Everyone looks forward to that first fall kickoff. Everyone feels the magic that has been part of Auburn for 125 years. This feeling, of course, is not restricted to those who live, work, and study on campus. It is shared by generations of the Auburn Family, young and old, who celebrate this new year in a way that is uniquely Auburn. They flock to campus on football Saturdays by the tens of thousands. And once here, they are part of something every bit as important as the game: tailgating. Many campuses are known for their hostile game day atmospheres. That’s not the case in the Loveliest Village. Tailgaters from Ag Hill to the Student Center Green Space to the Hayfield to the Old Row enjoy food and festivities, but it is a welcoming place for all. Little kids are doing their best Stidham-to-Davis impressions, while their parents and grandparents speak quietly of Nix-to-Phillips and Sullivan-to-Beasley. It’s all there, so alive in the mind’s eye, underscored by the sharp scent of barbecue, the deep dishes of deviled eggs, that perfect plate of pecan pie. 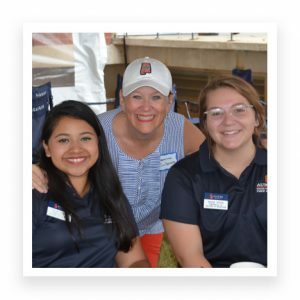 On a recent Saturday, for the Ole Miss game, the College of Education hosted its own tailgate under the shadow of the old Allison Physics Laboratory beside Graves Amphitheater. It was an 11:00 kickoff so the menu emphasized coffee, juice, fruit, biscuits, and hashbrown casseroles. More than 100 old friends, former professors, and children and grandchildren of our loyal alums joined the party. They were tended to by our fine young College of Education Ambassadors. More memories were made. And the 35 first-half points Auburn put on the board? Well, that was just gravy. Those who were at the tailgate tent aren’t likely to forget a favorite College of Education alum who was on campus for the game: Charles Barkley, the Round Mound of Rebound, the greatest basketball player in our school’s history and Auburn’s goodwill ambassador wherever he goes. Charles is known for his brash opinions and laugh-out-loud wit. But he has another side: helping people. He supports disaster victims, and makes a generous annual gift to one of the College of Education’s most successful outreach programs. Famous? Of course. Opinionated? It’s who he is. But it’s all family. It’s all football. It’s just part of the new year on the Rolling Plains of Dixie.